Hola Lexicans! How are you? Today I'm back with a book review, this time reviewing MG mystery The Goldfish Boy by Lisa Thompson. As you all know, I love mysteries and MG books when I'm looking for a nice and easy read, so when my sister recommended this I was all over reading it! I really liked this book! As a character, Matthew was well-developed and I sympathised with him throughout the book. 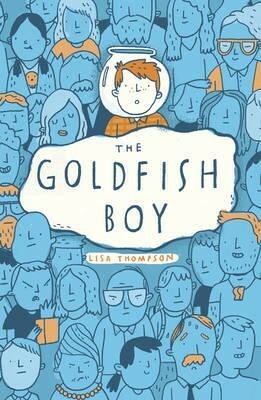 The story reminded me very much of The Curious Incident Of The Dog In The Night Time by Mark Haddon, and Smart by Kim Slater as they both contained a boy of about 12 years old, with some form of a mental disability solving a mystery so if you enjoyed either of those books, you will love The Goldfish Boy. One of the great things about this book, was that there was a lot going on yet it never got confusing or like there was too much happening. A book just about Matthew would have been sufficient, as would a book just about the mystery, but both makes is perfect! I often find that books with a lot going on, often are very confusing and will cause me to go back and re-read certain sections, particularly as I'm such a quick reader. Overall, I loved this book and would recommend it for 8-11 year olds. Personally, I'm above the recommended reading age for this, yet I still love to read a good old MG book now and again and this was definitely worth the read. Next post (which should be up this Sunday), is on the theatre play School Of Rock, which I went to see last weekend. Oh I really want to try this one now! I really loved the Curious Incident (although I thought the protagonist was actually 15? But I might be misremembering because it's been YEARS since I read it😂) and i'm really glad that MG tackles things like OCD to bring awareness too. I'm glad you enjoyed this one! Hi Cait! Thanks for stopping by:) I think you're right and the protagonist was 15, was a mistake on my behalf ahah whoops. I agree and think it's great we're having more diversity in MG, definitely want to see that keep on coming in 2017.